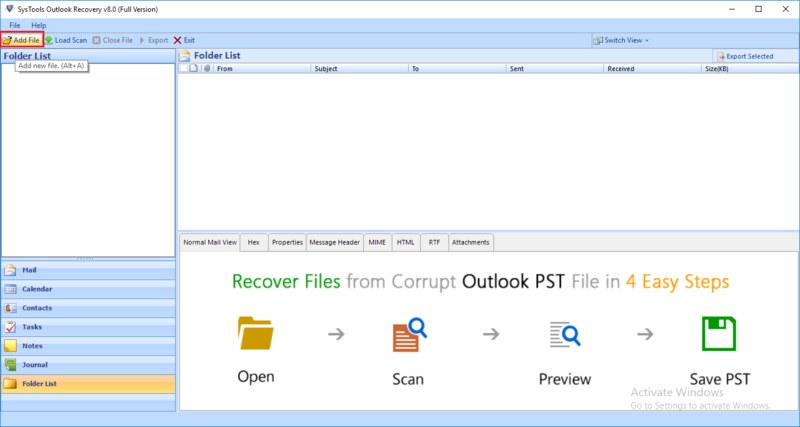 Advanced Outlook Deleted Email Recovery utility to retrieve lost, orphaned items or permanently deleted emails from Outlook PST Files without tampering its integrity. Recovers Permanently Deleted Emails from PST file Proficiently. Restores and Previews recovered emails or items. Retrieves Accidently deleted folders & items such as calendar, contacts, tasks, journal, appointments, meeting requests, RSS feeds, & notes. Offers Advanced mode for Lost, Shift Deleted, Soft or Hard Deleted Outlook Email Item Recovery. Recover Emails from damaged PST file. Option for Date Wise Email Filtration. Export Recovered Emails into PST, EML, PDF, MSG, HTML & Office 365 profile which will be easily accessible in Outlook & Windows Live Mail. Supports MS Outlook 2016, 2013, 2010, 2007, 2003 & 2000. Retrieve accidently or permanently deleted emails, messages, journals, notes, calendar and other Outlook items proficiently. Recover Hard deleted or Orphaned Email items from MS Outlook using Advanced Mode which performs deep level scan for complete extraction. 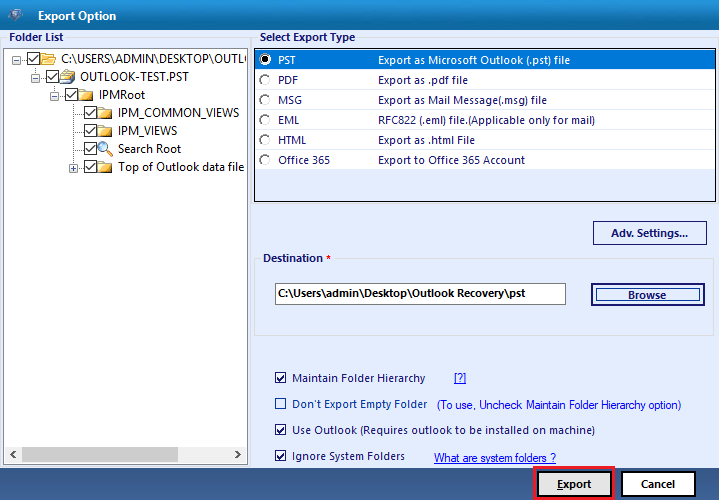 After Recovery, hard deleted outlook email recovery utility displays the emails constituted in the Outlook data file with Normal and Attachments views. Attachments recovered within the PST files are previewed with their contents in a separate pane. The software ensures that the proper folder hierarchy is maintained after scanning and recovering the deleted emails. Exploring emails recursively could be really troublesome if you need to locate particular email; browsing emails hierarchically eases locating emails. Deleted Outlook Email Recovery Software provisions multiple scan and recovery modes which helps to deal with file damage levels. The Software recovers from soft deletion of data but in case of severe corruption, hard deletion or recovering orphaned items; advance mode should be preferred. 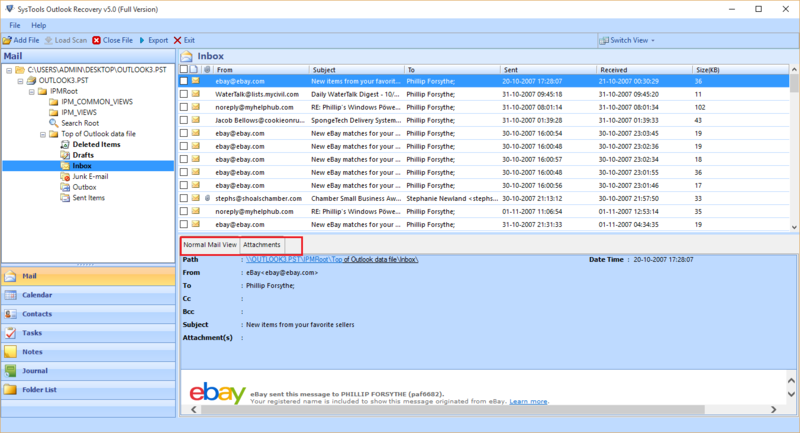 The software provide you an option to select date range for email filtration. You just need to enter date in From and To section and then rest of work will be done by Outlook Recovery tool. The software provide you facility to save recovered items into PST, EML,MSG and Office 365 email profile and like this you can access recovered emails in Microsoft Outlook and Windows Live Mail. Deleted outlook email recovery software ensures precise and risk free deleted email restoration from password protected or encrypted Outlook PST Files. It ensures loss free information retrieval without compromising user data confidentiality and integrity. 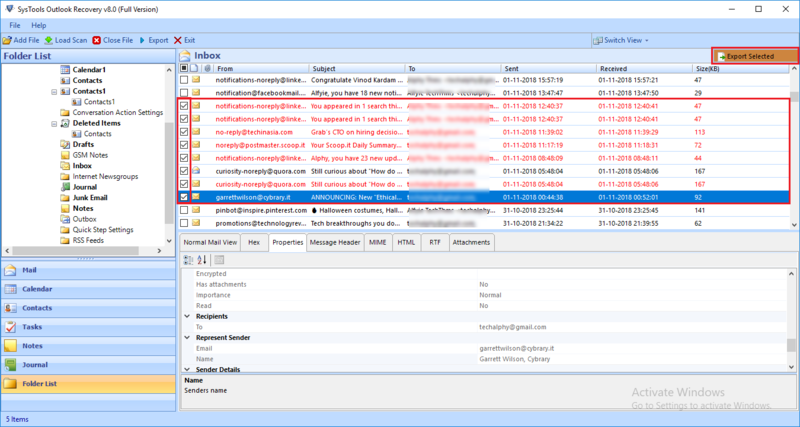 Application follows Outlook style user interface, thus making it easy to recover deleted emails from corrupt .pst file. With the User friendly interface, the application ensures that the users access information without facing any jeopardy to recover deleted emails from outlook. Emptying the Deleted Items Folder or Permanent deletion of items from the “Deleted Items Folder”. Accidental Corruption of Outlook Data (PST)File. These are the issues which leads to hard deletion of emails in Outlook, thus resulting in loss of crucial and confidential information. In case of soft deletion, the data could be recovered and managed easily but not for hard deleted emails. Inbuilt resolutions provided by MS Outlook such as scanpst.exe helps to repair Outlook PST files from corruption. It does not ensure retrieval of hard deleted emails from PST file data. Home Users, Organizations and Enterprises however maintain a proper archive or backups, which can be utilized to restore information. But in case of disasters such as inaccessibility of archives or backups worsens up the situation and refrains deleted email & items recovery. Here Deleted Outlook Email Recovery Tool plays a crucial role to recover deleted emails from outlook & retrieve hard deleted, orphaned or shift deleted emails. The software ensures durable & reliable recovery of deleted email items without compromising the data integrity. To perform Outlook deleted email recovery from an encrypted data file, the software restores the email items without tampering the original data file. Which can be used by the email forensic investigators for as a reliable eDiscovery solution while tacking litigation case involving compromised outlook PST files. Can the tool recover permanently deleted emails from backup PST File? Yes , with the help of advanced scan mode the software detects deleted emails from backed up PST files. Is there any file size limitation for the Outlook Deleted Email Recovery Tool? No, software does not impose any size limitation for , recovering orphaned email items or data from PST file. Does the Tool require MS Outlook Installation while recovering deleted emails & contacts? 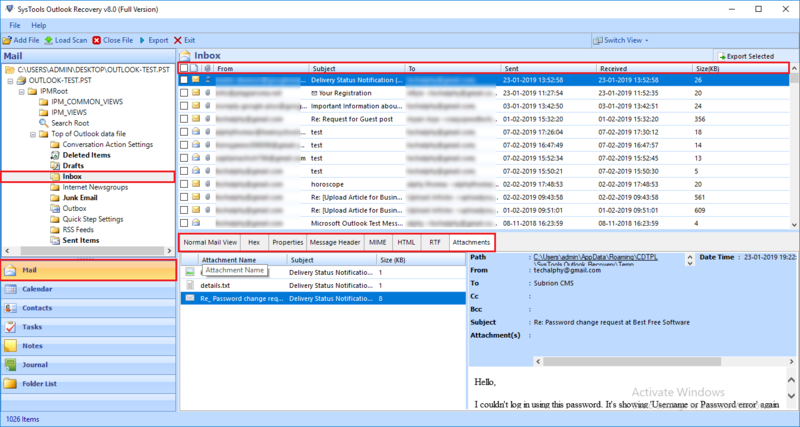 Yes, MS Outlook Installation is required to recover accidently purged Outlook contacts & emails. Deleted Outlook Email Recovery Software helped me recover data from Outlook 2013 encrypted PST files. Using the advanced mode, it was much easy to retrieve & preview data from encrypted email data file. After perilous searching for a recovery utility that could recover my oprhaned email items, I found EmailDoctor's Deleted Outlook Recovery Software. The utility worked like a charm and saved my organization from suffering a huge loss of confidential information.. Faced with an Intellectual property theft issue, suspect employee tampered his email data files beyond access. With the help of Outlook Recovery tool we were able to recover the deleted emails which leveraged as an inculpatory evidence in penal court. Outlook Recovery Software helped me execute multiple tasks such as password protected email recovery and conversion to EML format. Thanks to its robust scanning, recovery & export mechanism, the tasks were completed in no time.